FHS FFA Public Relations Team State Champions! Read about their road to the State Championship! 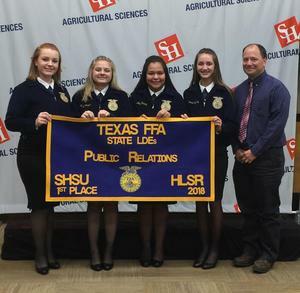 For the second year in a row, the Floresville High School FFA Public Relations Team brings home the State title. The young team consisting of three freshmen, Karina Lyssy, Calysta Rethaber and Abby Saenz, and one junior, Haleigh Peterson, surprised their sponsor, Mark Jarzombek, with their poise and confidence. “What this team accomplished is nearly unheard of. None of these girls had been a part of the FFA before and they competed against seniors. There were rarely nervous and always ready to compete,” Jarzombek marveled. After winning 1st place at the Guadalupe Valley District contest, they advanced to Area, where they placed 2nd. The next step was the State semi-final on Friday, November 30, at Sam Houston State University. The team finished 5th after the semi-finals, high enough to land them in the finals. “After Friday’s announcement, we felt relieved that semi-finals were over and prepared for Saturday’s finals.” That preparation paid off the next day at the finals where the girls jumped up to 1st place. “We were on cloud 9 when it was announced that we won state! This experience will always be a great memory,” said Haleigh Peterson, the only upper classman on the team.